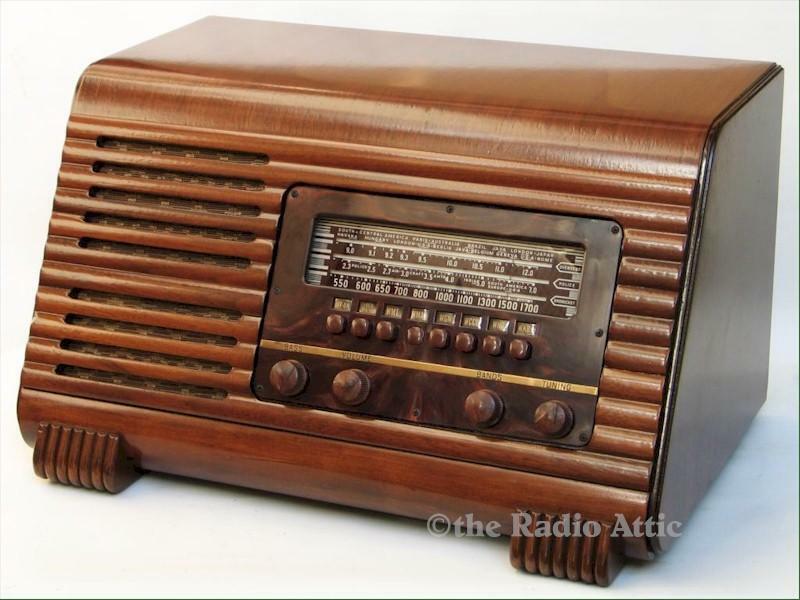 This large Philco table radio has an unusual design with a sloping front panel. Basically, it's the same chassis Philco used in their very popular floor-standing consoles, packaged in a smaller cabinet with a 6" speaker. This radio tunes three bands: AM broadcast, police, and shortwave. It also has electronic pushbutton tuning for seven preset stations (you can set them to any stations you choose). The eight-tube chassis has a push-pull output stage for powerful audio with high fidelity. All paper and electrolytic capacitors have been replaced, all switch and control contacts cleaned for noise-free operation, the RF and IF sections have been fully aligned, weak tubes replaced, and a fuse added to bring things up to more modern safety specs. The original power cord is in such beautiful and safe condition that I decided to leave it in place. The cabinet has been refinished, and the escutcheon is a reproduction. The performance of this radio with its built-in loop antenna is simply outstanding, with top notch sensitivity and good sound quality all around. This is a radio you can really enjoy using every day. 19"W x 11"H x 13"D.
You are visitor number 2,734 to this page.